This Father’s Day weekend treat dad to a day on the links or a fine Muskoka feast. Families can celebrate the much-anticipated opening of Santa’s Village or share a cool ice cream cone. Take a few sweet swings on Bigwin Island, one of Canada’s best golf courses. Accessible only by ferry, boat or plane, this trip makes for an adventure in itself. Cool down with a real-cream cone from Kawartha Dairy Company. Choose from among your favourites—banana, cookies and cream, mint chip—or try a new flavour like wolf paws (chocolate butter fudge and brownie bits in vanilla ice cream) or death by chocolate. Celebrate the most wonderful time of the year six months in advance at the seasonal opening of Santa’s Village in Bracebridge. Ride Santa’s sleigh or soar on Rudolph’s roller coaster before exploring the petting zoo and many other attractions. Raise a glass at Spencer’s Tall Trees. The Huntsville restaurant offers a Wine Spectator award-winning list of vintages, plus such reasonably priced entrees as pan-seared pickerel fillet and roasted rack of Australian lamb. Give dad a great combination gift: food, oldies tunes and more than 100 special-interest vehicles on display at the Bracebridge B.I.A. Father’s Day Car Show. Catch opening night of Gravenhurst’s Music on the Barge. The annual concert series kicks off with the Muskoka Concert Band, which soundtracks the sun’s descent over Gull Lake. JUNE 20 TO AUGUST 15 Close out a summer weekend with Music on the Barge, a Sunday night tradition. Since 1959, Gravenhurst residents and visitors have gathered for concerts at Gull Lake Park’s waterfront stage in order to get down with jazz jams, Dixieland ditties, folk tunes and more. Catch a homage to wthen check out Beatles tribute band The Caverners on July 11. Free, concerts start at 7:30 p.m.; call 705-687-3412 or click here for more information. The Muskoka region melds the glory of nature with modern convenience and amenities. Experience it all this weekend! On your way north, stop in at Bayfield Mall to stock up on necessities. More than 70 stores—including Winners, Canadian Tire, Price Chopper and Pharma Plus—help ensure you’re prepared for any situation. Take in stunning greens, tall trees and expansive Muskokan vistas while challenging yourself to a round of golf at North Granite Ridge. Head to Muskoka Wharf in Gravenhurst to stroll along the boardwalk, investigate the the Muskoka Boat and Heritage Centre or indulge in dining and shopping. Kids can frolic in the playground and water-play area. Enjoy modern artists’ interpretations of works by the Group of Seven and Tom Thompson—more than 40 pieces are displayed at Huntsville’s Group of Seven Outdoor Gallery. View Ontario wildlife at indoor facilities and while venturing across 50 acres of walking trails. The Muskoka Wildlife Centre is an interactive learning park for all ages where furry woodland creatures make for a memorable trip. Browse the shelves of The Bookcase, an independent bookstore housed in a Huntsville historic building, and pick up a new tome or an old favourite to read on a quiet cottage-country evening. Things to do in Muskoka don’t dwindle down even as summer does. Our special four-day itinerary offers much to do over the Labour Day long weekend. 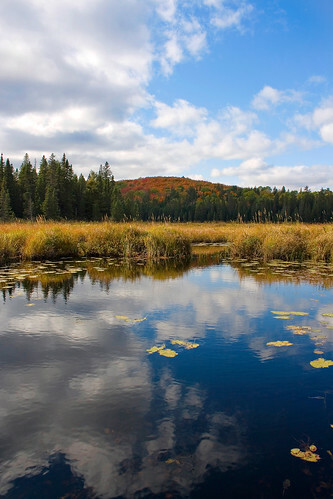 Explore the vast expanse of Algonquin Park this weekend (photo by Craig Moy). Discover what happens when art and agriculture come together at Muskoka Place Gallery‘s Harvest Muskoka exhibition, featuring artwork capturing the region’s crops and food production. Choose the perfect outfitting package at Portage Store for your long-weekend hiking trip through Algonquin Provincial Park. Learn about the role of women in boating in Boat Builders of Muskoka: Past and Present, a display on the elements of design, building and production of wooden boats, at Gravenhurst’s Muskoka Boat and Heritage Centre. Bite into a succulent lobster tail–topped rib-eye medallion while dining on the waterside patio at Blackburn’s Steakhouse in Huntsville. In Haliburton, admire the breathtaking view of the Algonquin Highlands from the vantage point of the 100-foot high Dorset Tower. Pick up jars of creamy maple butter from Bracebridge’s Maple Orchard Farms—a perfect gft for your friends back home. Get an early start on Christmas at Santa’s Village and Sportsland in Bracebridge, where you’ll shriek with delight while riding Rudolph’s Sleigh Ride roller coaster. End the weekend by lounging in your Muskoka chair dockside, nose buried in a novel by Muskoka author Christina Kilbourne, available at The Gravenhurst Book Store. Your Muskoka weekend itinerary is here with lots to see and do. Saturday, in particular, looks like a doozy! 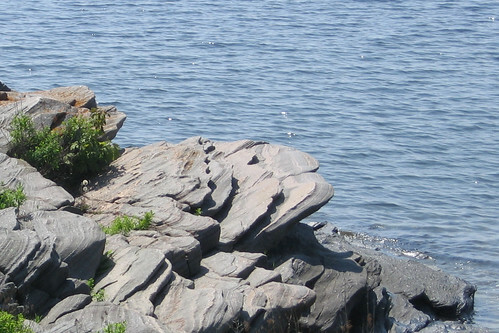 Explore the geology of Killbear Provincial Park (photo by John Vetterli). 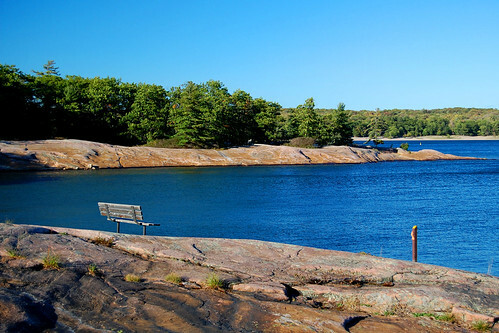 Discover patches of exposed bedrock at Killbear Provincial Park, a boreal oasis located on the southern edge of the Canadian Shield. Purchase authentic antique Canadiana at the 26th annual Bracebridge Antique Show & Sale from a selection of furniture, jewellery, coins, china, pressed glass, paper, dolls, quilts and more. Lace up your running shoes, unfold your map and pocket your compass for Muskoka’s First Annual Amazing Race! Over the course of the day, follow clues and test your skills to take you on a challenging trail from Gravenhurst leading to Huntsville. Hike to the Haliburton Highlands for The Forest Festival in—where else?—the forest. As the sun dips below Bone Lake, listen as former Canadian Brass trumpeter Stuart Laughton lead the Forest Festival Brass in an outdoors-themed concert. Sip Earl Grey and nibble scones spread with jam and Devonshire cream at Blue Willow Tea Shop’s traditional high tea. What better a way to enjoy the view of the Muskoka Wharf? At the Muskoka Lakes Museum in Port Carling, take in the region’s wildlife and people through the lens of local photographer Andy Zeltkalns. It’s all about festivals in Muskoka! Perfect for the (anticipated) sunny weather this weekend. 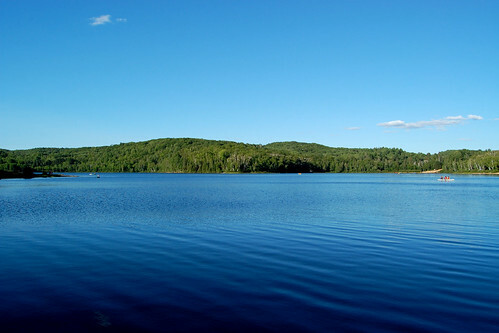 Enjoy a day of boating and fishing at Arrowhead Provincial Park (photo by John Vetterli). Kick-off the weekend by picking up something original from one of more than 130 Canadian artists and craft vendors at Gravenhurst’s 18th annual Dockside Festival of the Arts. Purchases in hand, stay for the food and live entertainment. Instead of dinner and a movie, do dinner and a play tonight. In its fourth year of bringing dinner theatre to the Gravenhurst Opera House, the Dragonfly Theatre Company performs “See How They Run,” a fast-paced comedy set in an English vicarage. At Bracebridge’s Art in the Heart, discover painters, woodworkers, sculptors and other emerging Muskoka artists honing their crafts along Manitoba Street and its connected laneways. This year the festival also offers street entertainment, from theatrical performers and dancers to musicians and magicians. In the afternoon, indulge in a cottage country beer and food tasting at Muskoka Cottage Brewery. The event includes an exclusive tour of the Bracebridge microbrewery. Head out on a Sunday-morning fishing trip with the family for rainbow trout and small-mouth bass at Arrowhead Provincial Park. Tap your toes to the guitar, autoharp, and banjo sounds of country-bluegrass band The Good Brothers tonight at Gull Lake Park. The nine-time Juno Award winners play the closing set for Gravenhurst’s Music on the Barge, a regional tradition since 1949. Greet the beginning of summer in Muskoka with open-air activities and indoor indulgences. Discover the glacier-sculpted islands and remote ruggedness of Georgian Bay on a two-hour Island Queen Cruise. Upon a sturdy Icelandic horse, gallop through the Almaguin Highlands and along the pristine shores of Newell Lake at Clear Lake Farm. Stimulate your senses with cottage air, country fare and cold cream ale on a tour of Lakes of Muskoka Cottage Brewery. Delight in the decadence of the Summerside Surf and Turf Kitchen Party, where you’ll find fresh lobster, succulent steak, an oyster bar, salads and a side of East Coast entertainment at Parry Sound’s Charles W. Stockey Centre for the Performing Arts. Take in the tranquil terrain of pink-granite rock walls and verdant valleys while you tee off into the sunset at the Lake Joseph Club. Soak up some sun and celebrate Father’s Day at Gravenhurst’s Gull Lake Park while enjoying toe-tapping Music on the Barge.